Just typing the words "child abuse" makes me sick, and just plain mad. As I'm assuming it does for most. But what about "elder" abuse? Do you even know what it is? We treat children specially because we have determined, as a society, that they are not responsible enough to be left alone, make their own decisions on important matters, or handle finances. Thankfully, the Texas Department of Family and Protective Services is there for the old folks too. 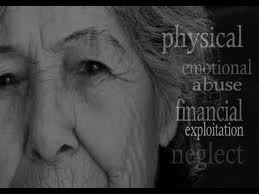 The department offers services for "any adult who has a disability or who is age 65 or older over that is in a state of abuse, neglect, or exploitation." Lets break this down into what this means, and how to look for it. You have a (neighbor/friend/family member/parent hereafter "Papa") who is getting on in years and/or suffering from a disability. As a result, they require home health care. You have never really paid attention to Papa's finances, but have noticed that home health care attendant (hereafter "Anna Nicole") is coming around more often, and Papa is speaking about them more. You notice one day that Anna Nicole is driving a new, different car, and generally looks like she has new jewelry. Then you ask Papa, and he tells you they are getting married. You can take a guardianship out on Papa to control his finances, but they are expensive. If he is competent, get a Power of Attorney over Papa. You likely just need to sit Papa down, tell Anna Nicole to get lost, and hope she hasn't done too much damage. Check Papa's bank accounts, insurance policies, and any brokerage or financial accounts, and see if Anna Nicole's name is there or if she has somehow become a beneficiary. Tell the police, but usually the best bet is to get Papa away from the damage and stop the bleeding. Also, report Anna Nicole to the Texas DFPS at 1 800 252 5400 so they will have her on record. You have a (neighbor/friend/family member/parent hereafter "Nani") who lives alone and has no kids. Nani passes away, and leaves you, the favorite niece, in charge of the estate. You start going through Nani's finances and realize that something is amiss. You find in her personal papers, amongst her will, is a Power of Attorney naming someone you are not familiar with (hereafter, "John"). You do a little more digging and check the banking records, and realize that John has cleared out a significant amount of money from Nani's accounts. For a real life example, see here. Call the police. They prosecute this stuff. Hopefully you can try and get some of the money back, but you never know. The best way to fight it is prevention: talk with your elderly friends and make sure they have their estate and powers of attorney in order. You can't stop all fraud and exploitation, but you can prepare and try to limit the potential damage. I try and bring levity to most topics, but elder abuse is not funny on any level. Often, the above scenarios are much worse, and physical abuse, threats, and emotional abuse are going on as well. The point is that abuse is abuse, and we all deserve a voice. There are resources out there to stop this terrible practice. Lets educate ourselves, know the warning signs, and do something about it. Have an adopted child, have been seriously mistreated by her. She's only interested in various family members when there's money involved that she can benefit from. She's fleeced her one grandmother of so much money, it's mind boggling. She's charming and sweet when there's money or gifts involved. She became involved with an older couple who have a daughter they adopted as a teenager, and has almost made that girl persona non grata. It's awful. They offered to adopt our daughter, who's almost 30, they started going to her Grandparents church and she helped them transfer hundreds of thousands of dollars to this "New Dad" and it has severely affected the finances, and how much her Gma can get from her OWN money, to pay for her needs, medical bills, retirement home, etc. We've found it quite strange howw they latched on to this adopted child, and vice versa. She didn't agree to have them adopt her, because it will limit what she can inherit from us, her biological Mother, and various family members. We also have life insurance, and she was listed as a co-beneficiary, if we die together, or if we should die within a few months of each other. We want to change our beneficiaries due to this on our life insurance policies, and update our will(s). However, since she is an adopted child in Texas? Is there a MINIMUM she can get from us, in our will(s) or life insurance? How can we help her biological Mother protect her Grandma's assets and investments? The Grandma signed a new will and POA whilst in hospital, on heavy medications, and this daughter and "new parents" her husband's dad, enabling them to sell her SUV, expensive art and collectibles, fur coats, etc etc. They also made POA decisions to move her to a new retirement community, while she was heavily medicated and signed off on the move, selling the afore mentioned items, furnishings and much more. Now that the Gma is healing up after surgery? She's asked where many things are and these people have "forgotten where the things could be". We want to protect our other kids' and grandkids, whenwe die, as they've been wonderful kids'. We also want to protect her Gma and other grandparents, who she thinks she can get money and valuables from, living or once they've passed. We wish she would to be adopted by these new "parents" but she knows she may do better financially, from her biological Mom, and us and our families. We want to leave something to her, that's just taking the high road (and keep our kids' and grandkids' out of probate court). But we can't figure out what the minimum we can leave in our will, and life insurance policies, to her. We are very concerned about the things sold and Visa credit card charges, her suv being sold, all whilst Grandma was in hospital with surgery and on heavy pain medication. Thank you for any help on this MESS. Please send us a link email or phone # so we can set up a consult/hire you. Thanks!! I'd love to help, my contact information is on the right of the screen.